Production of the U.S. Passport Card began on July 14, 2008. As of March 2010, more than 2,700,000 Passport Cards have been issued to U.S. citizens. A US passport Card is used as a federal ID and is only good for travel to Canada, Mexico, the Caribbean, and Bermuda at land border crossings or sea ports-of-entry and is more convenient and less expensive than a passport book. The passport card cannot be used for international travel by air. If you have a U.S. passport book and are eligible to use Form DS-82, you may apply for the card by mail. You must renew your passport book at the same time that your apply for your passport card so your passport book and card have the same number. If you have never had a U.S. passport book, you must apply in person using Form DS-11 as a New applicant. All passport cards will be returned using First Class Mail. Passport cards cannot be shipped to you using overnight delivery. The Passport card also has some great security features. It uses state-of-the-art security features to prevent against the possibility of counterfeiting and forgery. A protective RFID-blocking sleeve is provided with each passport card to protect against unauthorized reading or tracking of the card when it is not in use. The Chip increases speed, efficiency, and security at U.S. land and sea border crossings, the passport card contains a vicinity-read radio frequency identification (RFID) chip. There is no personal information written to the RFID chip. This chip points to a stored record in secure government databases. With RFID technology, Customs and Border Protection inspectors will be able to access photographs and other biographical information stored in secure government databases as the traveler approaches an inspection station. Can I apply for the passport card and passport book using the same application? Yes, simply check the appropriate box at the top of the form to indicate that you would like to apply for both products. If you already have a passport book and are eligible to use Form DS-82, you may apply for your new passport card by mail using Form DS-82. You may renew your passport book at the same time using the same form. Does the passport card contain an electronic chip? Yes, the passport card has a vicinity-read radio frequency identification (RFID) chip. How many photos are required when applying for the passport card? One photo will be required for the passport card. State-of-the-art security features minimize the possibility of counterfeiting and forgery. The card is issued with a protective sleeve that prevents the card from being read when not in use. What documents will I need in order to apply for a passport card? The passport card has the same standards and requirements as the passport book. You must provide documents that establish your U.S. citizenship and identity. The passport card is the wallet-size travel document that can only be used to re-enter the United States at land border-crossings and sea ports-of-entry from Canada, Mexico, the Caribbean, and Bermuda. The card provides a less expensive, smaller, and convenient alternative to the passport book for those who travel frequently to these destinations by land or by sea. When did the passport card become available? 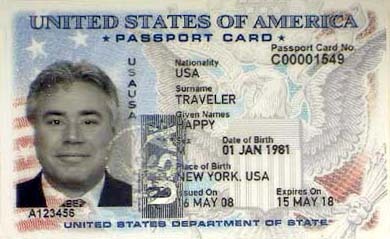 Production of the U.S. Passport Card started on July 14, 2008. As of March 2010, more than 2,700,000 Passport Cards have been issued to U.S. citizens. Where do I apply for a passport card? First time applicants can apply at any one of the 8,800 Passport Application Acceptance Facilities across the country. Locate an acceptance facility near you and submit your application today! Why can’t I use the passport card to fly to Canada, Mexico or other countries? The passport card was designed for the specific needs of northern and southern U.S. border communities with residents that cross the border frequently by land. The passport book is the only document approved for international travel by air.